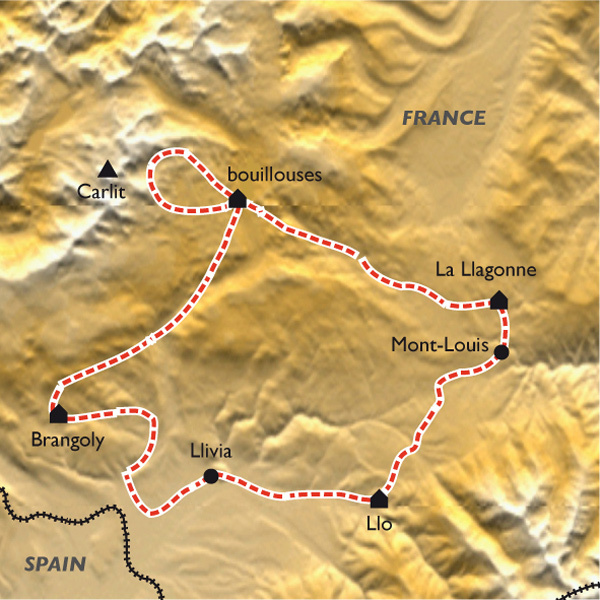 You begin on the Mediterranean influenced Cerdagne plateau - usually plenty of sunshine, but never too hot. Discover traditional villages, unspoilt river valleys and ancient churches before arriving in a region populated with lonely lakes. A most enjoyable and satisfying circular journey. A gentle, more Mediterranean climate is matched by mainly gentle walking with lots of valleys, lakes and interesting villages to explore - the best of the Med and the best of the mountains. Authentic and high quality accommodation with excellent cuisine too! Standard option: You make your own way to the first night's hotel in La Llagonne. With extra airport pick-up: We pick you up from Perpignan airport or railway station and take you to La Llagonne. Pick-ups also available from Toulouse, Carcassonne, Montpellier, Girona or Barcelona (please consult us for prices). Your arrival on the Cerdagne plateau will undoubtedly fill you with anticipation of things to come as you will have wonderful views across the plateau, and of the mountains all around. While thoroughly contemporary in its facilities, the family run three star Hôtel Corrieu is located in the heart of the village, and still retains much of the character of an authentic Pyrenean mountain hotel, but now offers a sun terrace, a spa zone, and panoramic views from its restaurant that is justly popular with locals. A good first night is assured ! Transfer: 1h30+ (if you choose the private transfer from Perpignan airport). You begin your journey with the gentle exploration of the surprising UNESCO World Heritage Site of the citadelle of Mont-Louis, designed by Vauban and with its walls all still in place. Then you can enjoy a delightful stroll across the Cerdagne plateau - Pyrenean for sure, but also with the warmth and flora of the Mediterranean evident all around you. 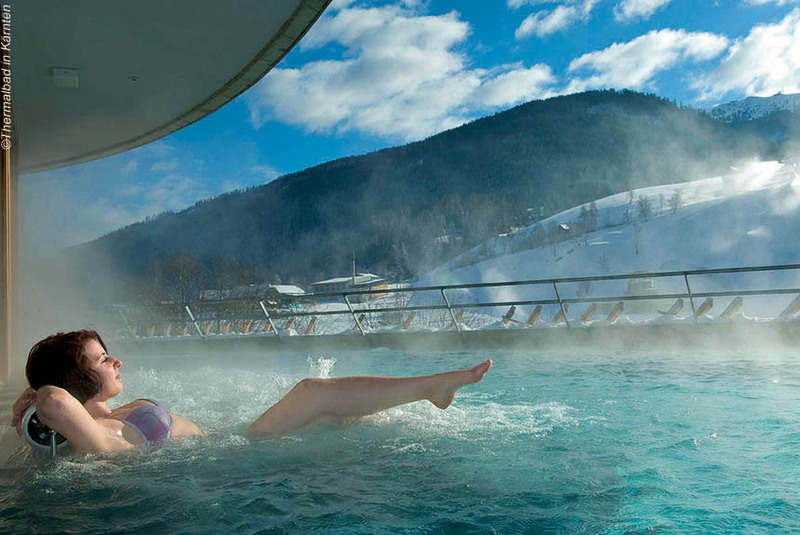 You can choose between shorter and longer itineraries, but either way you be ending your first day visiting the attractive and largely unspoilt valley (forests, waterfalls and alpine wildflower meadows) and village of Eyne before arriving at Llo where you can relax in its naturally warm baths (pay locally). Not a bad first day! You stay at the wonderfully and sensitively restored ancient stone farmhouse called Cal Miquel in the 4,500 feet village of Llo with its uninterrupted panoramic views all round. All the rooms are full of character as is the dining room where we're confident you'll enjoy dinner and breakfast that seems like it comes from another age - in all the best ways. Walking time: 4h30 or 6h. Distance: 12km or 20km. Elevation : + 150m or 400m / - 350m or 750m. Another interesting day as you walk generally northwards, crossing the Yellow Train tracks - hopefully you'll see it clanking its way slowly up the mountains - and then crossing the Spanish (Catalan) enclave of Llivia, surrounded by French territory (an charming anomoly of the 1659 Pyrenean Treaty). You'll then walk to delightful Dorres, renowned since prehistoric times for its naturally warm baths, developed by the Romans and still there to be enjoyed today, plus the 12th century church of St Jean with its famous bell tower, Black Virgin statue and memorable views. 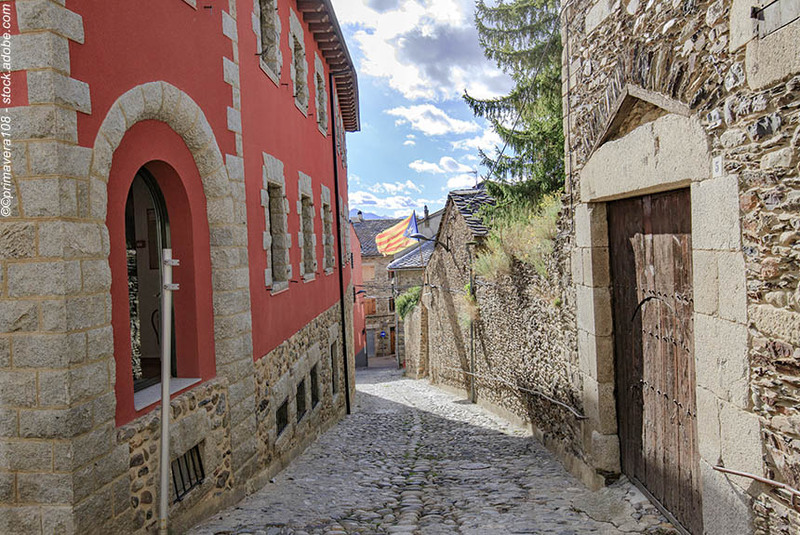 From there you can walk up to the chapel of Saint Mairie de Belloc for amazing 360° views and then on to the unforgettable Chateau de Brangoly where you'll stay the night in no little comfort and tranquillity. The 18th century chateau is only the latest in a line of castles and houses on the site that has welcomed (or repelled) Romans and Cathars among many others. It is superbly isolated on its own estate, and has been remarkably well restored with characterful rooms, and a charming restaurant with memorabe food that has a strong local bias in terms of recipes and produce. 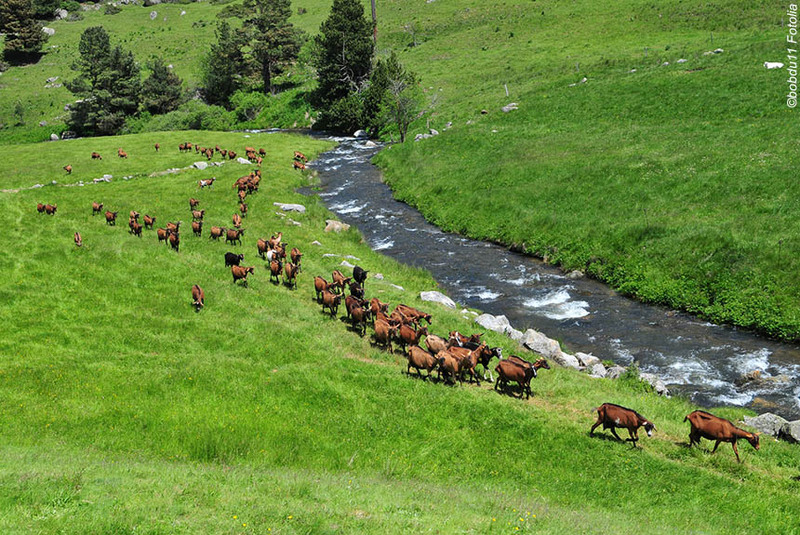 Today you leave the Cerdagne plateau and walk gradually up the Angoustrine valley beside its rolling and tumbling river as it becomes ever more "sauvage" (wild) as it gains altitude. 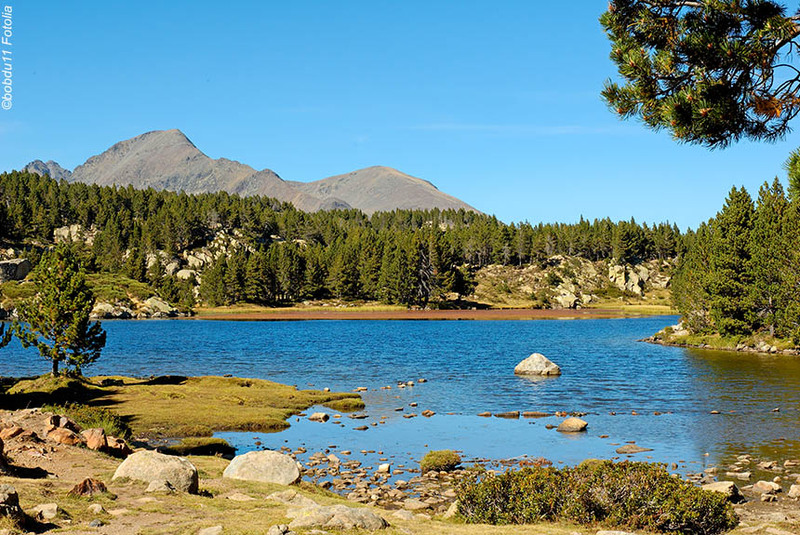 You walk through alpine meadows, then pine forests to arrive at the lovely Pradelle Lake before the last stretch to the much larger Bouillouses lake - your hotel for the next 2 nights is situated just above it!. You stay at the magnificent and remote mountain hotel called Bones Hores (on a half board and picnic basis) right beside the expansive Bouillouses Lake - look out for wild horses among other animals and birds of prey drinking at the lakeside. The hotel is just what you'd expect a mountain hotel to be, while offering you the comfort and good food you deserve after a rewarding day's walk. Walking time: 6h. Distance: 15km. Elevation: + 800m / - 250m. Today's walk is a circular one that takes you near or right alongside many of the dozens of lakes, large, small and tiny, around Mount Carlit. You are walking on a plateau, so there are no steep ascents or descents, and can enjoy the wildflower meadows that characterise the plateau, particularly in spring and early summer, as well as the tumbling stream that connect the lakes. It often feels like a privilege to be up there surrounded by nature at its finest. If you are feeling fit and the weather is good, we also provide you with a route description for the ascent of Pic Carlit. You stay again at the Bones Hores right beside the lake. Walking time: 3h or 5h30. Distance: 10 or 14.5km. 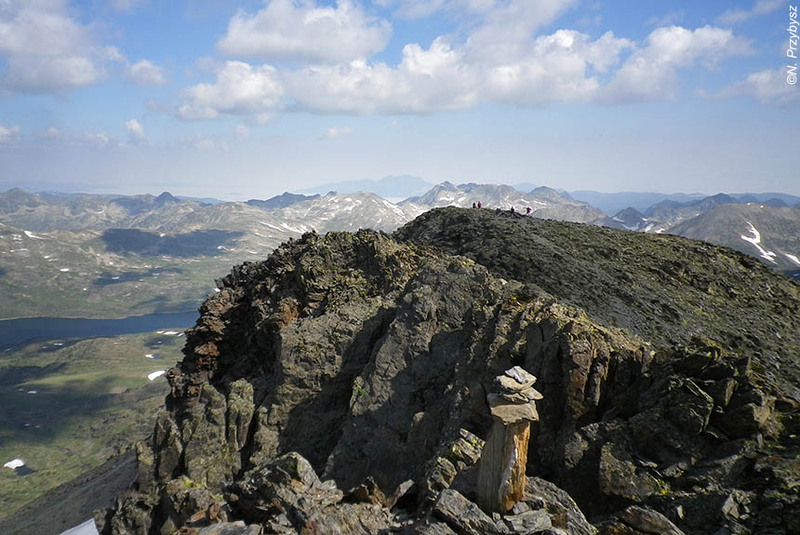 Elevation: + 350 or + 900m / - 350 or -900m. You follow a track up through pine forests to reach Aude Lake, which is the origin of the 139 mile long river than runs through Carcassonne, and enters the Mediterranean near Narbonne. You don't walk that far as you stroll through forests and alpine meadows enjoying occasional panoramic views as you make your way back to your starting point at La Llagonne. A most satisfying circular journey, we're sure you'll agree. You stay again at the Hôtel Corrieu where you may feel you now fully deserve the pleasures of the sun terrace, spa zone, and panoramic views. As good a last night as first night is assured! Walking time: 4h. Distance: 12km. Elevation: + 300m / - 650m. With extra airport pick-up: We take you back to Perpignan airport or railway station. Transfers also available to Toulouse, Carcassonne, Montpellier, Girona or Barcelona (please consult us for prices). 1 June to 30 September. This holiday features mainly comfortable, but some challenging walking, so is suitable for people who are reasonably fit, and used to walking (albeit "gently") for much of a day. It can get hot in July and August, as well as more crowded. We would recommend June and from mid August through September as the best months. You stay in double or twin rooms for 2 nights in three star hotel, and 2 nights in a particularly good mountain hotel, 1 night in an isolated rustic hotel that used to be a farm (truly exceptional atmosphere), and one night in a beautiful guest house. You will eat well. Dinners are based regional specialities. Breakfast is included every morning. Picnics are included for days 4, 5 and 6. When not provided, there are shops or cafés/restaurants nearby so you can buy or make up your own lunch as required. You can also consider speaking to your hotel on the previous evening for them to provide you with a picnic. This should be paid for directly. 6 nights dinner, bed and breakfast; 3 pic-nics; luggage transfers; detailed walking instructions; 1:25,000 IGN map; 24/7 customer phone service. The journey to the start point, and from the finish point, except as specified; lunches or picnics (except for days 4, 5 and 6); drinks with meals; non-standard menu items; entry fees; personal and travel insurance. "Perfect way to visit a stunningly beautiful part of France "